The advantages of AIS’s next generation Industrial PC (IPC), Panel IPC, Embedded Box IPC, DIN-rail PC, Thin Client, and IoT Gateway series are many. They offer a wide range of options: from distribution HMI solutions with client-server architecture, to machine level control and monitoring, to heavy-duty SCADA control systems. Engineered to meet increasingly complex processes, demanding data requirements and control tasks of machines and automation systems, they provide simple programming and operation. Using flexible and standardized interfaces for embedded computing allows for easy integration for almost any application, machine or industry. The AIS Embedded Panel IPC, Rugged Box IPC, “Thin-Manager Ready” Thin Client, and DIN Rail IPC series offer a sustainable and scalable platform, while reducing hardware costs and increasing security. Built on open architecture to deliver interoperability between systems, they enable application development and allow easy services deployment. AIS open platform, industrial PC and thin client also ensure network security and allows users to leverage new TCP/IP-based Networking, PC-based Automation, PC-based HMI, Soft PLC and DCS, Data Acquisition, Communication Gateway, M2M, Industry 4.0 and Industrial Internet of Things (IIoT) applications. Building off the flexibility of their popular Premium, Standard and Compact Series of HMI Touch Panels, the next generation of Embedded Box Industrial PCs and Thin Client IPCs offer the ultimate in computing performance. Thanks to Intel® Atom™ dual and quad-core, Intel® Core™ i3, Core™ i5, and Core™ i7 processor technology options, the embedded box industrial PCs from AIS can be equipped with to a customers’ exact specifications. Flexible mounting positions make them suitable for every installation situation from non-display computers to integrated display computers. Integrated solutions are including displays are available with both single-touch and multi-touch ranging from 7” to 24” screen sizes. Thin clients are suitable for automation, information and communication applications and provide nearly maintenance-free operation for harsh and/or typical industrial environments. The AIS Premium Box PC is the highest performing industrial computer with expandability for plant field and high performance machines. It utilizes an Intel® Core™ i7-4650U Processor (4M Cache, up to 3.30 GHz). The AIS Standard Box PC is a high performance industrial computer ideal for collecting and analyzing data. It utilizes an Intel® Atom™ Processor E3845 (2M Cache, 1.91 GHz). The AIS Compact Box PC is ultra-compact industrial computer for repetitive machines and infrastructures. It utilizes an Intel® Celeron® Processor N2930. These systems come with Windows Embedded Standard 7/8 and X86 PC-based platforms, and are modular, field-replaceable, easy to service, maintenance-free, rugged, fanless, shock and vibration resistant and able to withstand high electromagnetic environments. Moreover they come with UL listing and a CB scheme certificate. The Compact DIN rail PCs from the AIS Ex series are equipped with Intel® Atom™ multi-core processors; Quad-Core, Intel® Celeron® Processor N2930, 2M Cache up to 2.16 GHz, Intel HD Graphics supports DirectX 11.1, OpenCL /GL, and 4K videos Quick Sync encoder, onboard non-volatile DDR3L-1333 memory, 24 V DC (9.6 V to 28.8 V) isolated industrial power supply, high-speed USB 3.0 and Gigabit Ethernet ports, serial communication with multiple RS-232/422/485 I/O ports to form a space-saving industrial controller in the control cabinet. Open design with Windows Embedded and Linux system for maximum system flexibility, operation, programmability and sustainability. The extended operating temperature range between -20 and +60 °C enables application in climatically demanding environments. AIS ThinManager-Ready® Thin Clients have the ACP BIOS pre-loaded onto the Rugged Thin Client PCs, Compact Thin Client PCs, Rugged Thin Client Panels & Compact Thin Client Panels and can download firmware directly from ThinManager after the ThinManager Server IP(s) are specified. ACP ThinManager allows AIS ThinManager-Ready® thin clients and control terminals (touch displays in 7, 10.1, 12.1, 15, 17, 18.5 and 21.5 inch) to be configured in a central location instead of individually at each client. AIS ThinManager-Ready® Thin Client PCs and Panel Industrial PCs (IPC) are advanced control terminals. 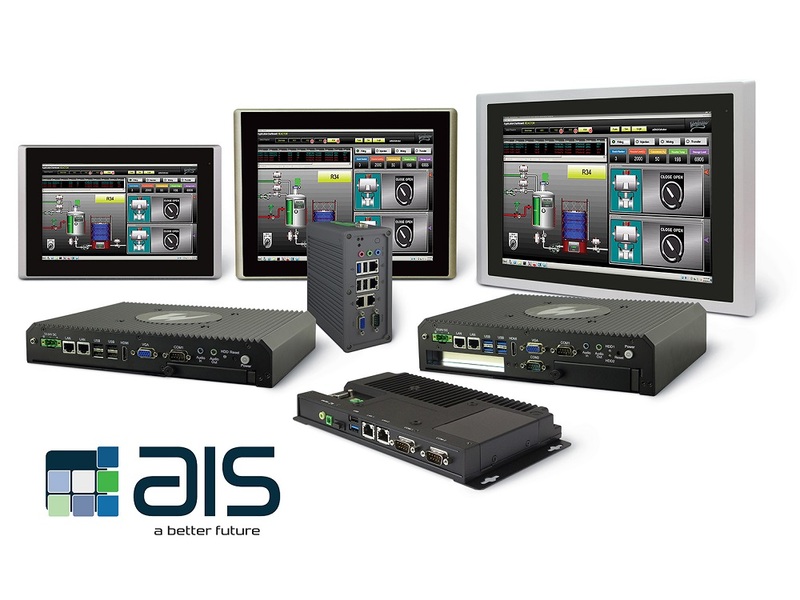 These flexible industrial thin clients from AIS allow users to achieve both distributed HMI control schemes with client-server architecture and/or machine level control connected to other control systems.